Much of the survival of heavy metal has depended less on innovation than it has on simply finding a new recipe, be it Iron Maiden fusing prog with opera, Motorhead meshing punk with blues or Metallica mashing Iron Maiden with Motorhead. 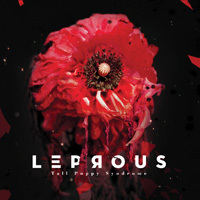 So at some point, it was both natural and inevitable that someone should cross late 80s/mid 90s, keyboard-driven prog-metal with early 00s major-key anthem metal and complicated mid 00s artcore, and out of that audio culinary experiment comes Tall Poppy Syndrome, the first proper studio release from Norwegian quintet Leprous. Kicking off with the Opeth-esque dirge of “Passing,” Syndrome immediately establishes itself as the work of a band still carving out its identity. Einar Solberg’s Euro-English power metal vocals drop any sense of art-rock symbolism and mythology in favor of stream-of-consciousness, high school poetry class lamentations (“Dragging my anvil of pain / betrayed / abandoned / rejected by life . . . soon is the moment I die”). More than anything else, it’s this kind of youthful uncertainty that informs much of Syndrome, be it the operatic vocals almost too tasteful for the delightful wickedness of “He Will Kill Again” or the piano and moving pitch-bent keyboard lead driving the middle section of “Phantom Pain” between polar opposite territory already staked out by Manowar on one end and Return to Forever on the other. Yet like many debuts from many young bands, the preponderance of kitchen-sink songcraft behind Syndrome ultimately hurts the album as a whole in its unfocused ambition rather than helping it with its genre-bending aspirations. Leprous shows itself fully capable of creating killer riffs, flawless changes, great sections and some surprisingly moving passages. But by trying to do all of those at once, the group mostly ends up accomplishing none of them. It’s not a bad metal album, but not really a great one, either; as musicians, Leprous have nothing left to prove but, as Tall Poppy Syndrome shows, their songwriting still has quite a ways to go.